This collection was acquired in 1946 from the estate of George Gehring Marshall, president of the Marshall Drug Company of Cleveland. The collection has approximately 300 works, including some of the rarest jewels in botanical literature and coincidentally in medical history, with its strength centered in over 125 titles printed before 1700. 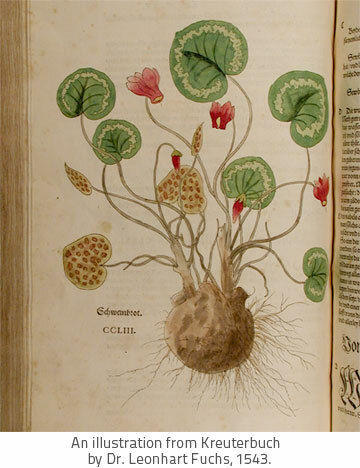 These books, written to describe the medicinal uses of plants, provide a printed record of medical knowledge and plant-lore from the Greeks through the Renaissance. For students of history and art, they document the development of printing and book illustration. The collection has six incunabula, including the seminal herbal, Herbarius, printed by Peter Schoeffer in 1484, and a complete copy of Le grant herbier en francois, printed in Paris by Pierre LeCaron. It also includes the most important of the 16th and 17th century herbalists, including Otto Brunfels, Leonhart Fuchs, and Hieronymus Bock. Interested in searched the collection archives? Visit our Archive page.